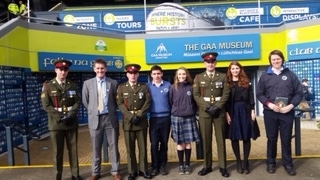 On the 7th of March, three 5th year students Leon Morgan, Oisin Kimmage and Áine O'Shaughnessy accompanied by Mr O'Leary and Ms Browne attended a state ceremony in Croke Park. 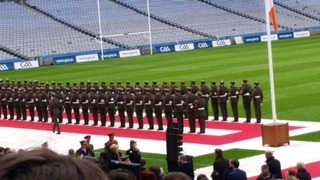 The event was part of the state 1916 centenary programme. 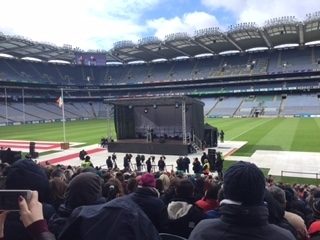 Ryan Tubridy hosted the ceremony and our President Michael D. Higgins and Minster for the Arts and Heritage Heather Humphreys. The purpose of the ceremony was to honour Thomas Francis Meagher, who was the first person to fly what became the Irish Tricolour in 1848 in Waterford. Leon was presented with a copy of the Proclamation, Amhrán na bhFiann and a handmade flagpole and Tricolour which now stands proudly at the foyer of Ardgillan.